Now that is one philosophy I can live by … and have since my very first holiday abroad. T.S. Eliot teaches us: "The journey not the arrival matters." I can't help but think these early 20th-century literary giants knew a thing or two implicitly about slow travel—how to embrace the time as we travel as much as where we travel. Have you ever found yourself so caught up in the moment that your heart skipped a beat? Cultural immersion is the key to unlocking moments such as these. Unless you're willing to break away from the rigors of a traveler's hotspot checklist, you'll never come close to connecting with a foreign land, its rituals, and most importantly, its people. We're about to embark on a voyage through exciting lands—this is a collection of vignettes—more about the journey than the final destination, as my title implies. One night in Florence, Italy, I faced the prospect of dining alone because my partner opted to stay behind after an exhausting day of exploration. But where was I going to eat, and do so all by myself? Promising never to succumb to the tourist traps that serve mediocre food at astronomical prices, I asked Monica at the front desk where she dined. In no time, I was at a nearby bistro dining with a Florentine family and some new friends. When I arrived at La pentola dell'Oro Osteria, I shuttered in my footsteps for it looked nothing more than a pizzeria with empty tables and chairs to boot. As it turned out, looks can be deceiving. I walked in and the owner Simon already knew my name and welcomed me. Surprised by his inside knowledge, I realized Monica must have called ahead. After a peck on each cheek, my first in Italy, he escorted me through to the kitchen to meet mama—cooking pasta of course (I am not making this up) and then led me downstairs into a 14th-century grotto replete with brick vaults and medieval wells covered over by glass and illuminated within. As Brunilda from Romania explained the menu, travelers at nearby tables chimed in with their recommendations. Before I knew it, we were all friends and with each new encounter, my embrace grew stronger. Traveling solo certainly has its advantages. A memorable experience in Volendam, The Netherlands, began when my colleague and I popped into a cheese shop brimming with over-sized wheels of golden deliciousness. Our mission was an encounter with the locals in hopes of learning something about Dutch living. Not only did we find out that the owner was a fourth-generation proprietor, but her daughter and grandson worked in the shop as well, making for three generations of Dutch cheese makers. Before long, we were sampling the goods, new versus aged, and all the tastes were scrumptious. We learned about the traditions of cheese making as well. Then something funny happened. Her grandson turned to me and told me to pick up two of the large cheese wheels on the pallet. Oblivious to his prank, I reached down to grab them only be pulled back down to the ground. "These are heavy," I exclaimed and we all laughed. I opted for one and with that, the family gathered around me for a cheesy portrait. You'll never find encounters like this on any itinerary in the world! With the 4th-generation owners of the Smikkelaar Cheese Shop in Volendam, The Netherlands. High in the hills overlooking Florence, the sumptuous Villa di Maiano in Fiesole is where we gathered at the table overlooking rolling hills of olive groves against a dramatic backdrop of the Florentine skyline for an authentic Tuscan feast. First up, wine tasting—locally produced whites and reds served with toasted bruschetta topped with prosciutto, tomatoes, and fresh parmesan cheese. Following this savory prelude was the antipasto —composed of various types of local salami, cheeses, olives and peppers, and drenched in olive oil. Finally, three delicious pastas with alfredo, marinara, or olive oil. I could have stayed here forever. 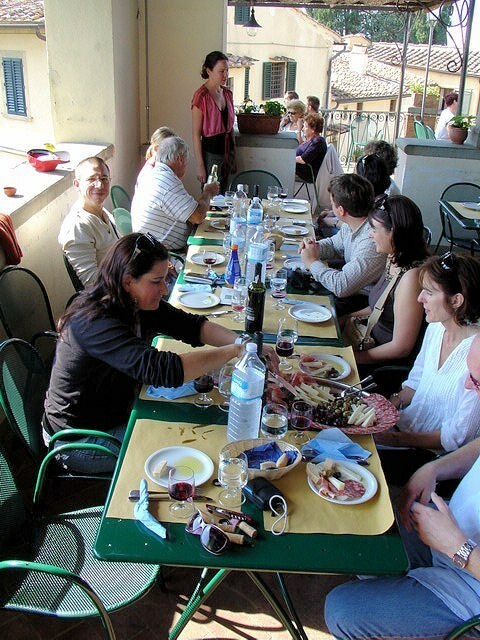 Tuscan cuisine was served villa-side in the hills of Fiesole overlooking Florence, Italy. While traveling in Bratislava, Slovakia, I no longer desired to keep up the frantic pace of our morning tour so I wandered down a cobbled lane to see more of this quaint capital city on my own. My curiosity was piqued after having spotted a gas lantern hanging above a doorway that led mysteriously downstairs. I peered down when suddenly, much to my utter embarrassment, the owner emerged from his subterranean vestibule and surprisingly welcomed me to the Segner Lounge and Restaurant. We spoke at length as he regaled me with stories about a physicist who lived in the old house 300 years ago. Then we proceeded on a little tour of this historic 17th-century dwelling. The ambience was a scene imported from Italy—vaulted ceilings, cloth-covered tables aglow in candlelight. What a sublime setting! Had I not broken away, I would have never had this brief encounter. How I wished I was staying for dinner. 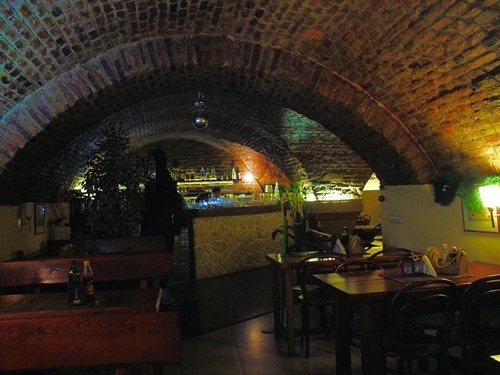 Vaulted ceilings and subdued lighting complete the Italian ambience inside the Segner Lounge and Restaurant. Having never seen a windmill other than those in my mind, I was excited to see these fascinating 18th-century structures still working the land as they have for more than 250 years. Welcome to Kinderdijk in Holland, a UNESCO World Heritage Site since 1997 and home to 16th-century canals lined with 19 working windmills. Before our tour began, we spent time with a miller who conveyed his heritage and traditions that are sadly dwindling with the advent of technology. 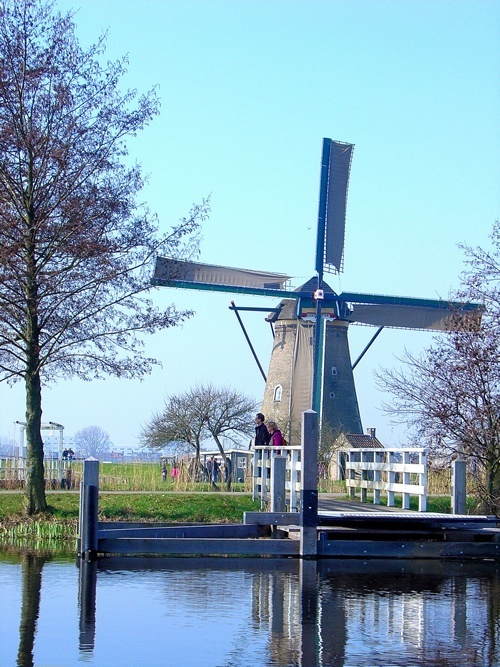 Today, there are just 1,024 working windmills in Holland, a far cry from the 10,000 plus at their peak. Needless to say, the number of millers hovers at 1,600. Thankfully, preservation efforts are in place to ensure we never forget the customs of the Dutch miller. One of the 19 windmills at the Kinderdijk Windmill Complex in The Netherlands. Suddenly we emerged from the darkened tunnel to the most stunning panoramic view of Lake Maggiore in Italy—twinkling lights danced upon its waters, reflections of distant shorelines aglow. From the moment we left the station in Florence, I knew I wouldn't be getting much sleep on this overnight train to Paris. And I didn't. Throughout the night, I continued to leap from my bunk to the window to peer beyond the panes and into my dramatic surroundings. Truly an unexpected adventure on the rails. With temperatures hovering at 32 degrees Fahrenheit, I shuddered at the thought of standing on the top deck of our river-cruise ship as we sailed into Budapest. Under the cover of night, we glided silently upon the waters as we imbibed our steamy libations—glühwein to warm our frigid bones. Suddenly, out of the darkness, emerged a city of gold—Budapest ablaze in light and poetic in its grandeur. Awe-struck, we marveled at this heart-stopping panorama as it unfolded and gently wrapped its arms around us in a warm welcome embrace. 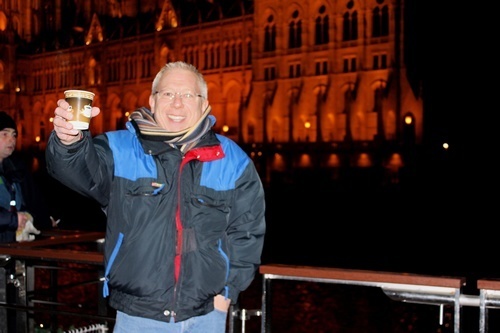 Drinking steamy libations as we sailed by night along the Danube into Budapest. Soaring mountaintops laden with snow, cascading waterfalls plunging down craggy slopes, waves lapping the hull of our vessel as symphonic melodies filled the air—a moment of euphoria on a voyage through southwestern Norway. We were plying the waters of the Lysefjord at the time on our way to Preikestolen or better known as Pulpit Rock, a precipice towering 2,000 feet. As we cruised, my spirit soared as high as the seagulls in tow along this adventure in the fjords. Cruising along the Fjærlandfjord, on our way to the Norwegian Glacier Museum, I captured this reflection of Norway’s scenic splendor. Beneath a canopy of stars ablaze in the night, our Viking longship plied the waters of the river on the way to Kinderdijk, Holland. Pastoral settings punctuated by an occasional village or two were just outside my stateroom. I stepped out onto the veranda when something magical happened. A distant pealing of bells hypnotized me as my eyes strained to see beyond the thicket. Suddenly a little village aglow under its sentinel clock tower, so picturesque, so charming, I fell under its spell. My gut told me to run inside and grab my camera. Thankfully, I thought the better of it, for had I surrendered to my whim, I would have sacrificed this ephemeral euphoria. Our driving adventures began at the rental-car agency in Florence and this lifelong dream of mine to drive through Tuscany was about to come true. Having never driven in any foreign country, anxiety was mounting, tension soaring, but as soon as we hit the road all was right in the world. We were on our way to Montepulciano and Pienza in southern Tuscany. Opting for the slower route through the Tuscan countryside (yes, we could have taken the A-1 which would have sped our arrival), we made our way to SR2 and followed the sunflowers and olive groves, vineyards ripe with bountiful harvests and quintessentially Tuscan Cyprus-lined roads. 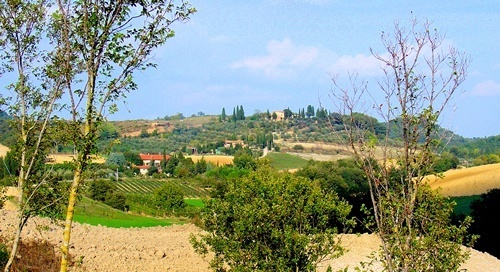 We rounded distant hills topped with medieval villages and Tuscan farmhouses. Everything you've ever imagined comes true in Tuscany—it's seductive, it's intoxicating. Driving along SR2 in Tuscany en-route to Pienza, Italy. 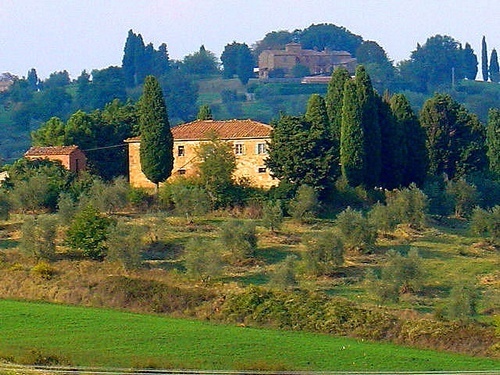 One of the many picturesque villas we spotted in Tuscany. 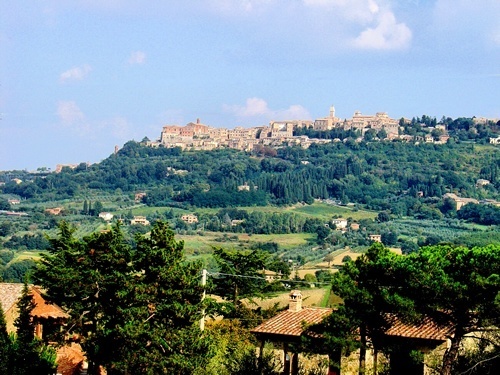 A view of Montepulciano in Tuscany. Experiences like these abound wherever your travels may lead, so seek them out when you plan your holiday abroad. Make time to connect with the locals, attend a festival, venture off the beaten path, revel in the solitude of your surroundings,—and follow your dreams. For these are the moments that become cherished souvenirs, my friends, and I hope that you return home an enlightened traveler. Frankly, I believe I am in good company when I proclaim my motto, "savor the journey as well as the destination!"